Note: Since it would need a lot of time for me to transfer all of my entries from my other site (TravBuddy), you may simply click on the links below to read more about it. All my Lakwatsa (Travels) moving forward will be posted on this website. Simply hover over Travels to get to the Itineraries section. Click on the Entries to get full details of the trip. Manila Bay.. Famous for its Sunset… Agree??! I’ve seen the sunset several times but never this close. Speechless.. I never realized it would be such an experience. Seeing the sun slowly going down the horizon was marvelous.. The mixture of colors in the sky as it slowly changes from to blue to violet to orange then red. Wow!!! Fish & Chips, Monarchy, English Football, Historic Landmarks and Double Decker Buses. Being able to travel and work at the same time is one of the best thing. For 3 months, I’m not just able to learn something new for work, I was also able to visit places like London, Liverpool, Manchester, Chester and Knutsford and stayed in Northwich. Not bad for my very first out of the country trip. How far can your 16,000 pesos go? Few months ago I challenged myself for a 10-day backpacking trip covering parts of Visayas and Mindanao without spending too much. Follow my entries on this blog to see how I did it and still managed to enjoy. Disclaimer: Tickets bought through PISO FARE are not included. Click on the Entries to check detailed account and expenses of the trip. As early as April, all are set for the summer. From Long White Beach of Calaguas Island to the Surfing Capital of Bicol Region to the Camping Site of Zambales, Anawangin Cove. Let’s Party and Enjoy the Heat of Sun! 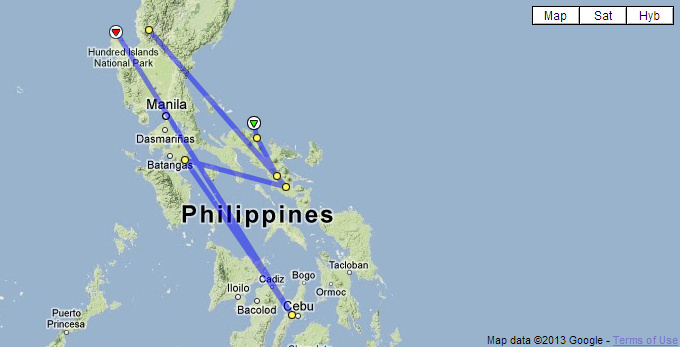 How do I ended up going to Palawan? Last March, I was just checking one of our local groupon site for a nice deal and without having any second thought I bought the deal. Voila! The deal is mine! Haha.. I actually thought redeeming it would be easy but you still have to make advance reservation so that they can get you a flight on your desired date. Yes! Airfare is part of the deal. A Romantic Two-Nights Stay for Two Persons in Palawan, Roundtrip Airfare, Hotel, Island Hopping for P9900. Haha! Not bad right? Click Home to check my recent travels and posts. Want to see where my Next Lakwatsa is? Simply click Next Destination.